Variant of Mirage - Condi DPS Chaos. This build deals less damage on the golem but is capable of massive bursts of Confusion, which allows it to deal strong DPS against bosses that attack often (mainly Sabetha, Matthias, Cairn, Mursaat Overseer, Soulless Horror, and Largos). Scepter is also viable. This deals better DPS on Largos, similar DPS on Soulless Horror, and is a very minor DPS loss on Cairn and MO, pulling ahead if you aren't able to melee the boss all the time (e.g. low dps groups on Cairn). Signet of the Ether over False Oasis is a possible change. 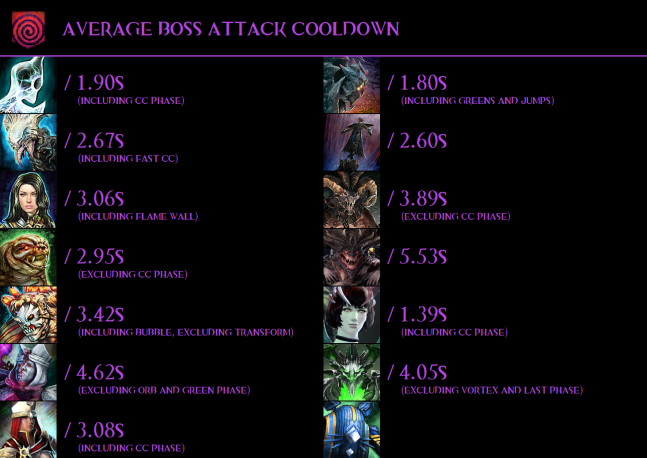 Dps difference is negligible. Never use Signet of Humility over Jaunt. This variation is no longer viable. For break-bars rather use 24px Axes of Symmetry and then Diversion while having three clones up. Alternately you can also swap to pistol and use Magic Bullet. This build revolves around a different priority list than the Mirage - Condi DPS Chaos. Using 24px Axes of Symmetry on CD. Using Shatters in a specific rotation to apply confusion through Ineptitude. Whenever casting a Phantasm through Phantasmal Duelist and Phantasmal Mage you'll want to follow this up with two shatters. The reason for using two shatters is due to Ineptitude that will give your target two stacks of confusion per shatter. Your first priority shatter is using Cry of Frustration as this shatter applies confusion per clone shattered. Due to the CD of this skill, you should only be able to cast this every second Phantasm skill. Your second priority shatter is Mind Wrack. Lastly use Distortion if you don't have any other shatters left. As per the rotation above always try pair your Phantasms skills ( Phantasmal Duelist or Phantasmal Mage) with 24px Lingering Thoughts so that two clones are spawned after you've you've shattered your old clones. Try shatter during the cast of 24px Lingering Thoughts to prevent shattering your new clones. Once you have your first two clones, use either False Oasis, Crystal Sands or Jaunt to quickly spawn the last clone. 24px Lingering Thoughts has a weird delay on spawning a clone. Get used to the timing that this skill casts a clone. If you cast your deception spells too early your clones will not be spawned. Never use 24px Axes of Symmetry with less than three clones. Due to the nature of this build your abilities are more important than your auto-attack chain so unlike Mirage - Condi DPS Chaos feel free to break this chain to cast your more important skills. Try never cap on endurance as this is wasted DPS. Try use False Oasis and Crystal Sands on CD. If you have access to Ethereal Fields (mainly created by your support chrono) spamming 24px Lingering Thoughts is a damage increase. Clone. Block the next attack. Counter by applying torment and creating a clone that casts Ether Bolt. Shoot out a bolt that blinds foes in a line. From here, the rotation follows the same principles as the Axe rotation, dodging and collecting mirage mirrors as much as possible to maximize your casts of 24px Ether Barrage. See the tips above for how to use your shatters. Illusionary Counter will spawn two clones if you block an attack with it, or one if you activate the secondary skill Counterspell. This is useful for respawning clones after a shatter and thanks to Ineptitude you'll even inflict some confusion. How to see your real DPS in arcdps using "Personal Stats"
Currently the best performing Mirage DPS build. Slightly more complicated than the chaos variant but with the changes to Mirage this build now is the only viable mirage build to play in most situations. Once you get used to shattering and playing the rest of the rotation you'll always do considerately more damage than the chaos variant. The difficulty of this build adds a new layer of fun. Ludicrous DPS on all the fights where you'd bring Mirages and the best choice as well, outdoing Chaos except if you bring Feedback/Moa to Matthias and on Dhuum (but you're better off bringing Renegades to Dhuum anyway). Not only that, its inherent simplicity means it's very easy to get decent DPS with, however it cannot be understated there is a vast gulf between a mediocre Mirage and an excellent Mirage. Best in slot build for Mirage on MO, Soulless Horror, and Largos.